We already have a backpack essentials page on our website but it’s more geared towards a world trip. When spending your entire trip in a tropical climate, your bag will look very different to a bag that’s been around the world. You really don’t need much! Trust us when we say that you should be able to fit EVERYTHING you need into a small 40 litre bag. No more. 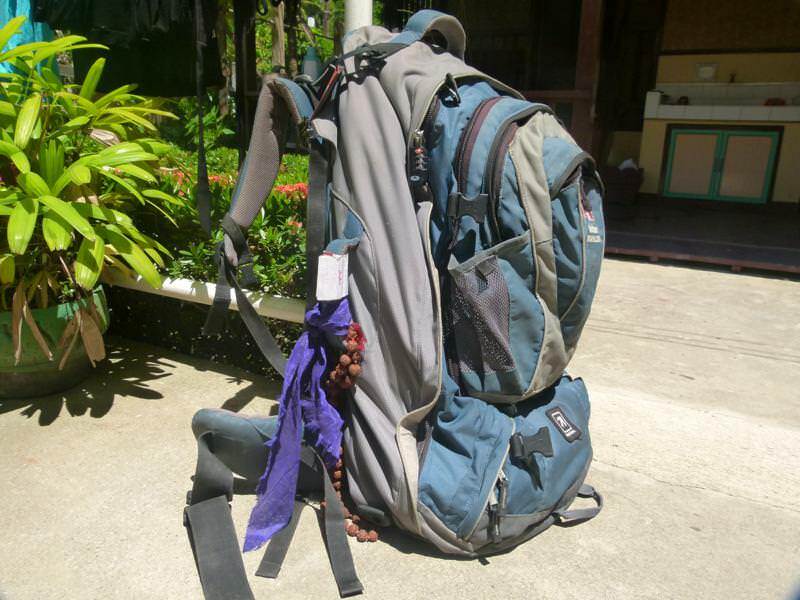 We had larger bags on our first trip to Southeast Asia and it’s just not worth it. Why not take a bag you can check-in on flights, a bag that fits at your feet on buses and a bag that isn’t going to hurt your back during long walks to your hostel or guesthouse. Women, leave your blow dryers, hair straighteners and makeup bags at home. This is backpacking and it’s not about looking pretty, it’s about having fun, and carrying 20 kilos of useless stuff is just not fun! And guys, you really don’t need a lot of outfits. There’s also a long debate about whether or not to bring a sleeping bag and tent. We are going to end this debate now by saying NO! Don’t bring a sleeping bag or a tent to Southeast Asia, just bring a sheet and a pillow case. One half of the sheet between the grubby mattress and your skin, and the other half between your skin and the mosquitos. 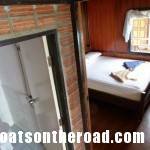 Southeast Asia on a Shoestring is a popular choice for backpacking SE Asia. Guidebooks. Lonely Planet: Southeast Asia On A Shoestring is clearly the most popular guidebook on this trail. You’ll see it in the hands of nearly every traveller on the road, and the ones who don’t have it are asking to borrow yours. Just remember that it’s a guidebook not a guide. You don’t have to stick to the pages, try to get off the beaten path in Southeast Asia as often as you can. You do not need a lot of clothing in Southeast Asia. Guys, a couple of pairs of shorts, 3 T-shirts, 3 pairs of socks, 3 pairs of underwear, a pair of light trousers, a light breathable raincoat/windbreaker, a hat and that’s it! Women we know you need a little more but you don’t need a whole wardrobe. Take a pair of shorts, a skirt, a pair of capri pants, a pair of leggings, a sundress, 4 t-shirts/tank-tops, a light-weight, breathable raincoat/windbreaker, a bathing suit (or 2), 2 bras, 5 pairs of underwear and 3 pairs of socks. Trust us, when you are in Southeast Asia, you will want to buy some cheap clothing, so don’t pack your bag full of your good clothes from home; just a few staples. Also, make sure to pack clothes that you can mix and match to make many outfits with – blacks, browns and greys are a good bet! We don’t recommend white clothes. This room may look nice but make sure to use your mosquito net! One more item you may want in your bag is a large mosquito net. Yes, most of the guesthouses, hotels, hostels & huts in Southeast Asia will provide you with one, however, they are usually riddled with holes, are too small (and therefore the net is basically touching your body!) or, they smell mouldy. Even if you think there aren’t any mosquitos in your room, or out that night, there are many, many other creepy-crawlies that you will want to keep off of your bed! Use the net. 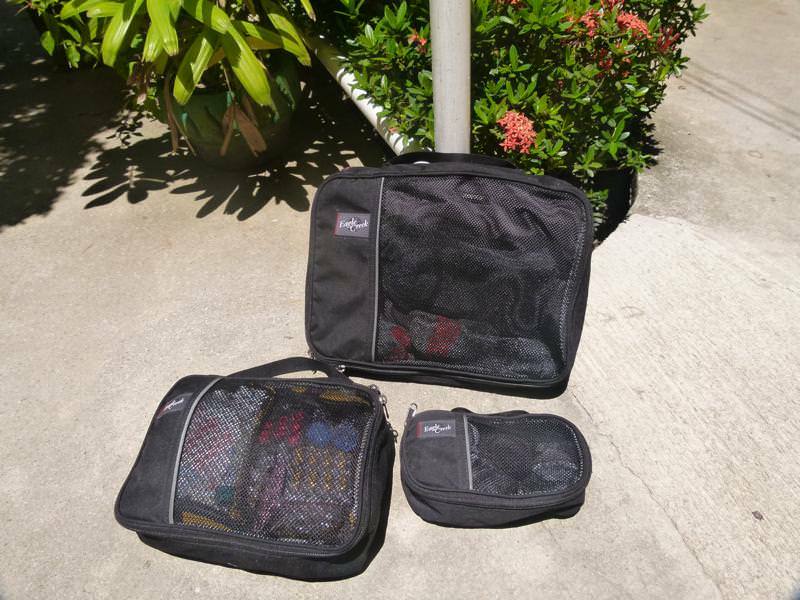 So, those are the only differences in your bag for a trip to Southeast Asia. Now check out our Backpack Essentials section to see the full rundown of what you’ll need. Just exclude anything that doesn’t belong in a perpetually tropical climate. This is a great guide to SE Asia. Well done, Nick and Dar! Thanks Charlie! There will be more to come on this guide. 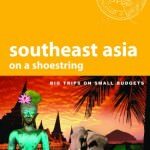 I know you referenced Lonely Planet: Southeast Asia On A Shoestring but is there any other travel books that you would recommend? Hmm, we honestly just go for travel blogs and review sites these days! We always look on TripAdvisor before booking a hostel/hotel and we use online booking engines for rooms – hostelworld, hostelbookers etc. There are many great novels though that you could read. But as far as guide books go, we always use the Lonely Planet. Great list, this is a life saver! Would you still recommend a 40L backpack even for 2-month travels through southeast asia? Or would it be better to aim for 50L in that case? 40 L for sure! I have a 32L bag for travelling full time 🙂 It’s amazing how much you can get into a small space if you pack smart! Travelling to SEA in a few weeks and just curious why you wouldn’t recommend white clothing? I’ve read (probably too many) blogs on what to pack and quite a few suggest light colors (including white) given the heat. Thanks in advance! I’ll be going SEA for over 4+months in March now, flights booked! What do you recommend like short wise? Chino shorts or Khaki shorts? Also footwear, obviously flipflops/sandals, but do you recommend walking shoes / plimsolls for clubs? Plan to do everything physically possible so, just want to pack smart! Hi guys, thanks for the good post. My girlfriend and myself are going to be travelling to SEA soon and we’ve got two questions that would help us a lot to make up our minds. 1) Regarding the backpack: you mentioned a 40L should be enough which is good because that’s what I had in mind. However, when you said “you should pack everything in 40L” did you mean you and girlfriend stuff as well or do you each travel with a 40L backpack? I know it might be silly but we were wondering if we could travel with a 40L and a 15-20L backpack for daily travel. Do you think that’s possible or would you recommend us to each get our own 40L backpacks. I’ve got a 30L Deuter trans alpine backpack, do you think that’d be enough instead of a 40L? 2) Regarding footwear: I can see that you mentioned that carrying a nice trekking shoes is recommendable but I’ve seen that other adventurer bloggers have been recommending a keen open-shoe, because of the rain, occasional rivers, etc. What would you recommend us? Regarding 40L, that is per person. It really depends on the duration of your trip. If you’re going for a year, you’ll want more space maybe, but if you’er going for a month or so, then you won’t need as much. How much space you need really just depends on what the two of you want to bring with you. 30L in my opinion is great for SEA – it’s not like you’er bringing heavy, warm clothing. Regarding the shoes, this depends on how much trekking you plan to do. We did a lot of jungle hiking in Sumatra and Borneo and therefore wanted a good shoe. Nick’s Keen hiking boots are waterproof actually. An open shoe is ok for certain things, it’ll all depend on your plans! Hi again. Thanks for the honest reply. You’ve made our trip cheaper 😉 already. We’re going to use the 30L one. Regarding the shoes, you’ve got a good point regarding jungle trips. We’re not going to go to Borneo but we’re going to walk a bit so I think in order to be on the safe side we’ll get some close trekking shoes. You’re welcome! I’m glad to hear my reply was somewhat useful 🙂 Happy travels guys. Agree – you definately don’t want to be adding weight to your backpack with a hairdryer and straighteners. Although I do bring makeup with me – tinted moisturiser or BB Cream, Concealer, Mascara and Blusher/Bronzer. Do you have any recommendations for nets? Also, for mountain treks ect would you recommend bringing a light jacket?